This review has been a long time coming. 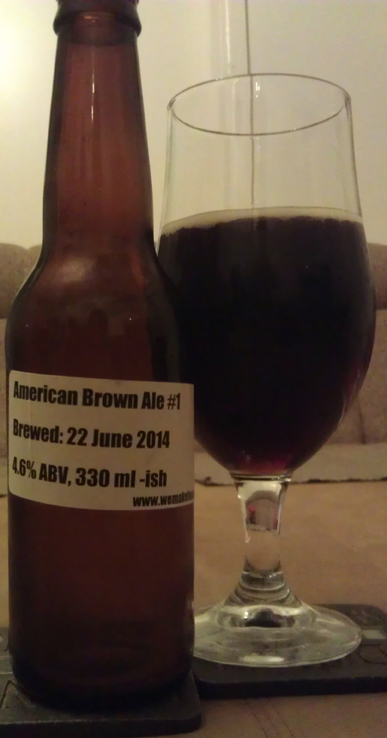 The American Brown Ale 1 was brewed back on 22 June and it’s now October. First up is the aroma. This has a really nice toast and dark malt smell. There’s even hints of chocolate in there. Not a lot of hops, which is a bit of a surprise given the crystal hops in there. At the end there’s a yeast aroma, which is to be expected from beer brewed with kit yeast. Taste up front is of light burnt malt. Light because the body is light as well. Not a lot of substance behind this. That is expected given it only has dry malt extract. While the body is light, the flavour is not. The dark malt characteristics comes out more bit by bit. Starting as a nice brown malt, moving into a burnt taste, then darker and more range. There’s a bit of a bite in there too. And that’s one of the few hop characteristics in this. Very slight fruit spice flavours on the edge. After a while you start to notice the yeast flavours. A bit tart. Strange sort of yeast. Not the best. I’m not too concerned about that as it’s towards the back of the beer and not prominent. The malt seams to drive most of this beer. There is a strange dryness at the end which is slightly off putting. That might be due to the yeast as well. Matching this beer isn’t too hard. Anything robust would work well. Anything with red meat would work. Even some chips and dip would go fine. Plus at 4.6% you can have a couple without worrying too much. Happy with this brew. But it’s not really an American Brown. More of an English Brown. Next time I would add more hops, and use a better yeast.